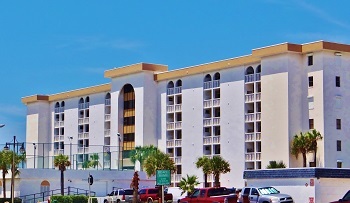 White Surf Condominium is an oceanfront complex that offers 2 to 3 bedroom units and located in Daytona Beach Shores on the drive beach. All condo units are oceanfront with private oceanfront balconies! The White Surf condo is close to everything including restaurants, medical clinic, drugstore, and trolley and bus service. International Speedway, Daytona Beach Kennel Club and Poker Room and Ocean Walk are about a 15 minute drive. This 7 story, 54 unit complex offers weekly rentals and 1 pet up to 20 lbs.